If you have an Android smartphone or tablet, here are two great Bitcoin wallets for your mobile device. 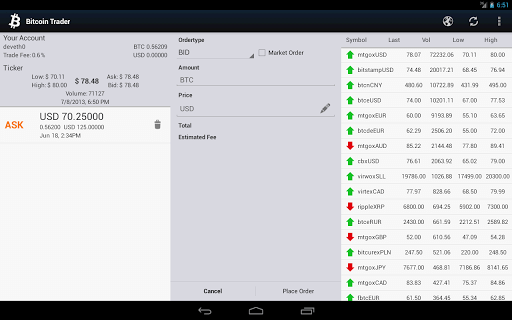 With this app, you will be able to trade Bitcoins at the exchange platform MtGox. All you need is an account at Mt. Gox and have this app installed on your device. This app will allow you to trade in different currencies, display price charts via bitcoincharts.com, access your account history, login using the Mt. Gox Application Access or API Key, get notifications about executed orders and widgets with the account and ticker information. You can get the source-code of this app at https://code.google.com/p/bitcointrader/ or download it here. 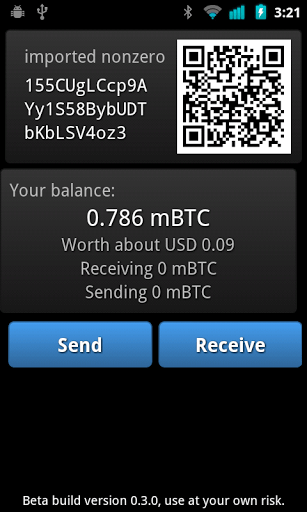 The beta version of Mycelium Bitcoin Wallet allows you to send and receive Bitcoins using your mobile phone. The features include total control over your private keys and there’s no need to make any download of the block chain, just install and run it. The Mycelium Bitcoin Wallet guarantees an ultra fast connection to the Bitcoin network, allows you to export generated keys directly to your SD card to print them securely with no intermediary computer and it also has safety features like securing your wallet with a PIN code. Besides, this wallet is compatible with other Bitcoin services.